← Beam you up – and smile! When does a performance start to take shape? In the case of Echoing Rooms it was when I got to know Pavel Resser and Ludmila Elkonina, my kindred spirits in Saint Petersburg. 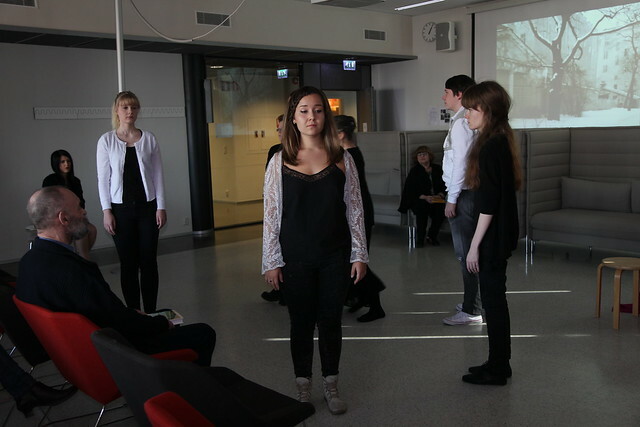 In spring 2013 they walked into Porvoo Campus and announced that every university needs a student theater. 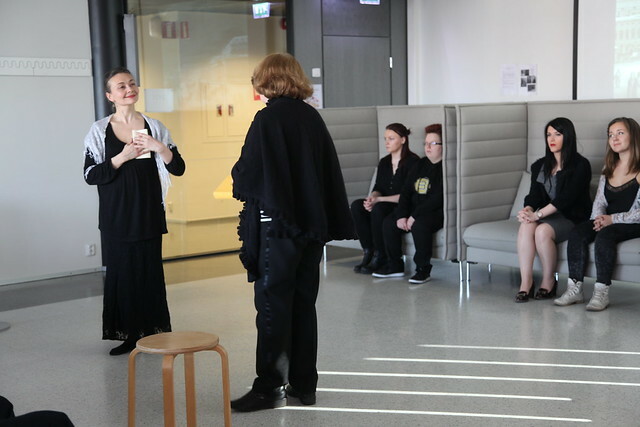 I had no idea how this would materialize on Porvoo Campus, however, the notion of a theater was planted in my subconscious and left there to rest for the time being. The first time I heard about Anna Akhmatova was in my late teenage years, so I had been aware of her oeuvre for a long time. However, my first real encounter with her as poet was when I visited the Anna Akhmatova home museum in Saint Petersburg on 1 April 2014, exactly one year ago. I wandered through the Echoing Rooms, looking out into the court yard with the silhouettes of the naked trees against a clear spring sky. I moved from room to room and the soundscape kept changing from the dance hall music in the salon to the oppressively ticking clock in Akhmatova’s tiny study. I vaguely recognized the violin solo in the last room representing her later stages in life, yet I was unable to put a label on it. Only later did I learn that it was Bach’s Chaconne. Next, I had a powerful vision of Pavel opening the performance with an early poem in Russian and with Ludmila closing with a late poem, also recited in Russian. Without these true representatives from a time past, the Saint Petersburg-inspired performance would not have been possible. Still, what was meant to happen between the opening and closing was yet to be discovered. Then came the Ukraine crisis followed by financial turbulence – our burgeoning theatre company was at great peril. However, I trusted that Pavel and Ludmila would sail through the storm as so many times before in their life. Then I had to find the student reciters for the performance. Again, I had a strong vision of the cast as it came to dynamics and kinesthetic presence. At the end, out of the initial six names I had in mind, only one had to cancel. Yet, he was soon replaced by a young man with genuine interest in performing on stage. The Finnish tourism students very soon got enthralled by the intriguing life of Anna Akhmatova and they chose their favorite poem translated by New York based translator Andrey Kneller, who had given his permission to use the texts. Somehow, all six randomly chosen poems formed a powerful entity. What a joy when my dear friend and multi-talented colleague Chryssa Skodra joined the cast. We met clandestinely once before the dress rehearsal and figured out the outcome of a friendship between two strong women, poetess Akmatova and actress-dancer Olga Glebova-Sudeikina: how it would start, how it would sprinkle and clash and how at the end, there would be nothing left but longing, Olga never to return again to Saint Petersburg from Paris where she had settled as emigrant. As expected, Chryssa and I immediately found the right tone in our contact improvisation, so there was no need to rehearse any further. Still, we did not have a performance yet – only fragments of a performance. Then came Tuesday 17 March and I had a happy reunion with Pavel and Ludmila in the morning. 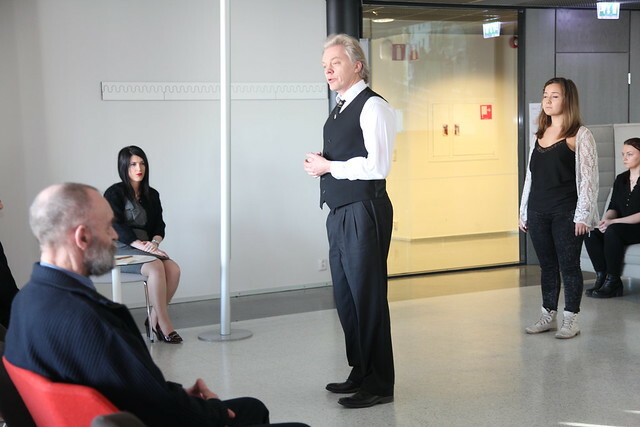 On our one-hour bus ride to Porvoo we had time to discuss the performance in detail. By four o’clock the cast was ready to start the dress rehearsal – all being well on time. 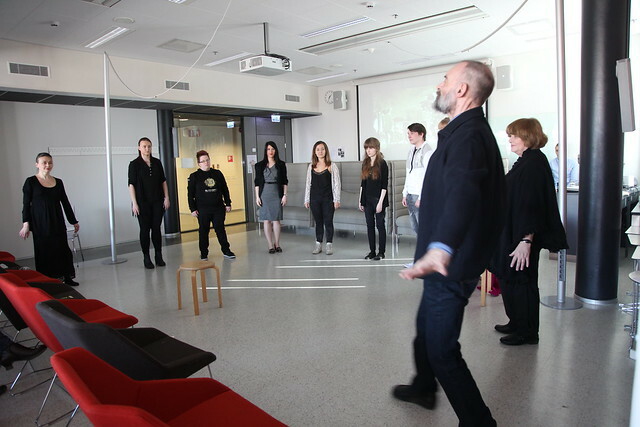 And then it happened by some magic, all of a sudden we had our theater company on Porvoo Campus. It must have been the presence of a Russian film and stage director and his spouse and companion in life that made everybody understand that this was for real. Everything fell beautifully into place, there was focus and commitment – and pure joy! 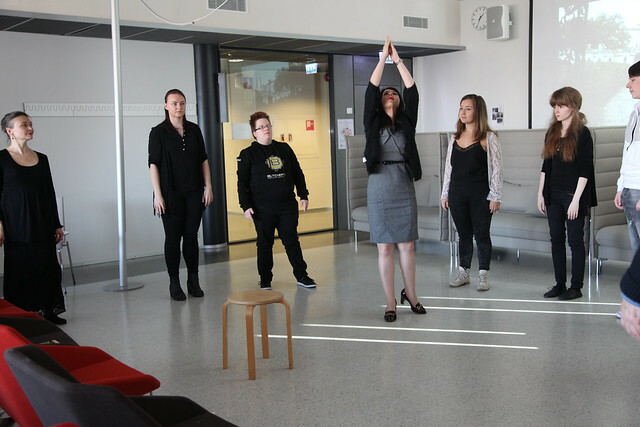 Classroom 3421 had been transformed into a theater – it did not take much: just a couple of coaches serving as stage, and the chairs removed to the rare end of the room. A chess table and three simple chairs. The illusion turning real. There were some unforgettable moments, for instance when Pavel taught young Mikael how to put a shawl on Akhmatova’s shoulders in an elegant old world manner. Also the Echoing movement poem at the end took shape and we decided not to involve the audience, since that would cause unnecessary stir. Ludmila was worried about the lethally slippery floor in Chryssa’a and my contact improvisation, but I knew that I could trust Chryssa 110% and thus take real risks (in the performance itself she actually saved me from a bad fall by pulling me back on my feet in just a fraction of a second). So at the end of the dress rehearsal we knew that we had a performance. A performance carved down to the very bone. Thus being a far cry from a sugar-coated opera production with plastic emotions played in guilded opera houses. No, I take no interest in such shallow depictions of human life. And I feel that also my students sensed the uniqueness of creating something rare and beautiful together as ensemble. The same feeling was also transmitted to Aron, the student who took care of the performance technique in dire conditions. Now the performance is just a memory, yet having left a strong and lasting imprint upon our soul. Photographer Jussi Niemi captured some intense moments, otherwise, there is no recorded trace left. Only a handful of people came to see the performance, half of them invited by me personally. What did we then all learn during this process? Firstly, my students learnt commitment and ensemble work. How important it is to come together and give your time to something you cherish, this obviously happened during the dress rehearsal when we saw all fragments suddenly making sense. Secondly, in a reality where it is trendy to say that “anything goes and it does not matter whether you fail or not”, my students got involved in a project where only excellence was good enough. We were not there to fail. And we all committed ourselves to that goal, the result being success, a production we can be proud of. Maybe this is the fundamental lesson we can learn from a theatrical production in a business school, when you strive for excellence there is no room for half-measures. What next? 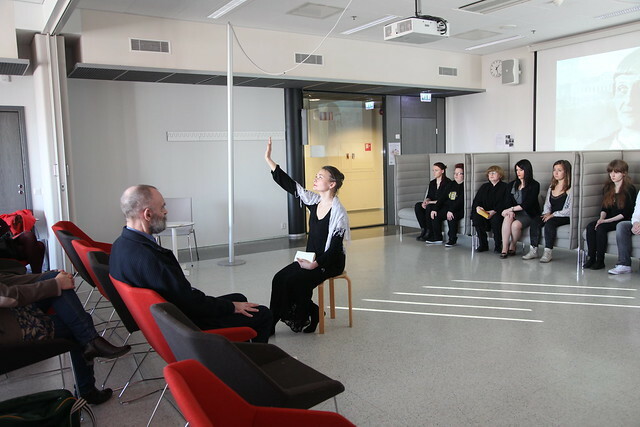 Pavel Resser is rehearsing Chekhov back in Saint Petersburg with his student theater ensemble of Saint Petersburg State University. I, on the other hand, find myself once again homeless with my artistic ambitions. Yet, nobody can take away the moment we had together as ensemble. Just before Pavel and Ludmila were leaving for Saint Petersburg, the four of us came together to plan the future for our ensemble. What an odd gathering of three generations and three totally different geographical locations: born in the 40’s, 60’s and 80’s, growing up in the Soviet Union, Finland and Greece in different decades – yet finding a profound and immediate understanding regardless of age or cultural background. Finally, sadly Chryssa’s name is not even mentioned in the program, she stepped in too late to become the brilliant assistant director she turned out to be during dress rehearsal. Chryssa, I tried to get your name added to the program in retrospect, but I was told that it was not possible after publication. Well, we all know that in this world very much passes unnoticed and unmentioned. 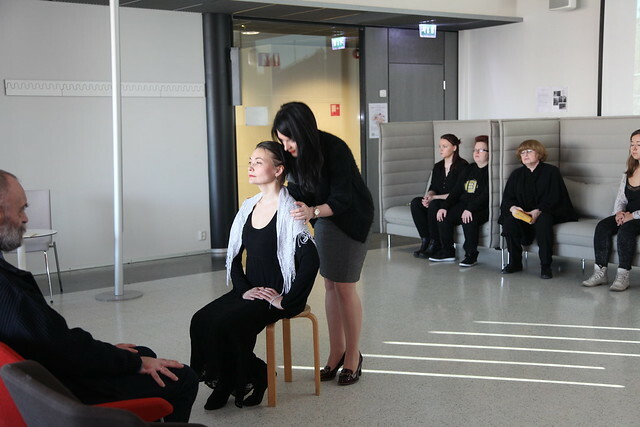 So, for a brief moment we had a real theater company on Porvoo Campus. It might never be heard again in that context, yet it flamed and made life beautiful and intense for the brief moment it existed. P.S. Thank you Veijo for your great singing in Russian. You never fail to astonish me! And thank you Ivan for your research at the Akhmatova museum. 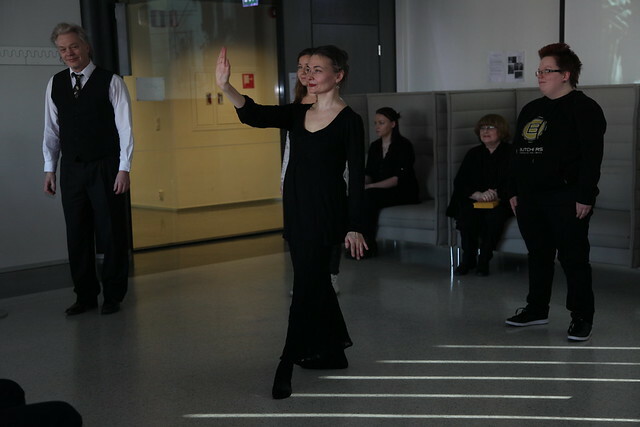 This entry was posted in Uncategorized and tagged Anna Akhmatova, poetry recital, Porvoo Campus, tanztheater. Bookmark the permalink. 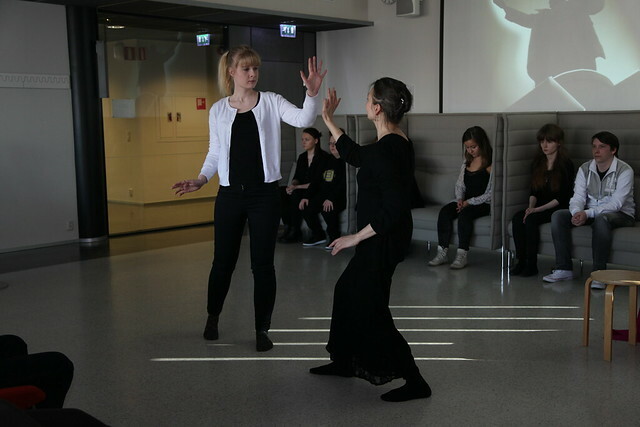 Thank you, Pia, for briding times and lands and for creating an unforgettable Tanztheater experience! You were absolutely flawless and everybody in the audience felt incredibly privileged to be part of the moment. It was raw, real, untamed, yet beautiful and dignified. This performance still resonates and will resonate for days to come in all of us. My graceful and talented colleague and beloved friend, Pia, you are a creative force to be reckoned! You put all the pieces together effortlessly and with the ease of the true creative professional that you are. There was an ultimate silence during our performance. Did you notice? I was deeply emerged in the moment and I sensed the audience was fully emerged in the experience, too. I teared up. It was emotional. About our performance, our hug was powerful. Plus, I would never let you down both literally and metaphorically. <3 Let us take our little theatre company elsewhere, wherever we find a hospitable roof to host us! Russia and the world, here we come! PS. I am not interested in having my name in any programme (thanks for taking the initiative, though! You are so fair!). This is only for people that have no contribution and they reply solely on appearances and having their name on a paper. Chryssa, your commentary reminds me of Virginia Woolf writing in her feminist manifesto, A Room of One’s Own, as follows: “I thought how unpleasant it is to be locked out; and I thought how it is worse, perhaps, to be locked in.” This applies to us and our theater ensembe as well. We definitely don’t want to be locked in! Thanks for once again pulling me back on my feet, as you did in our performance. I will carry that feeling in my muscles for the rest of my life.